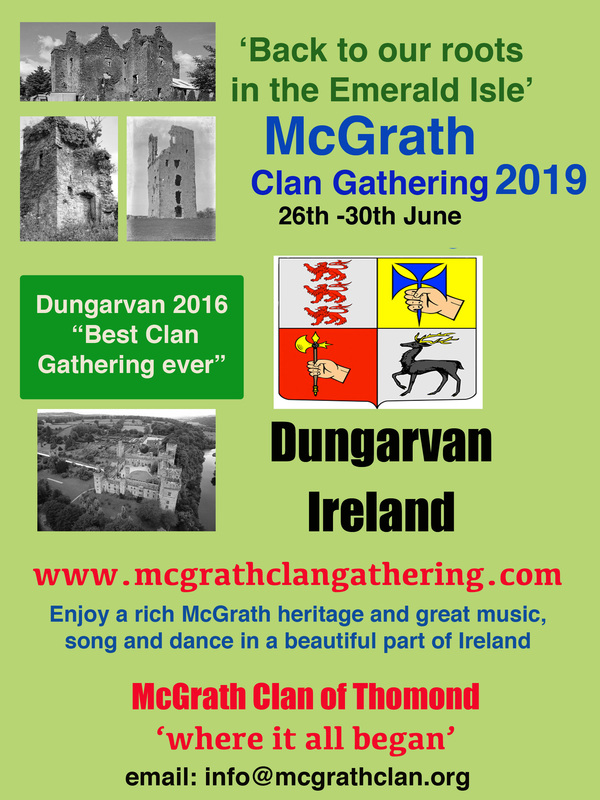 Just over 2 weeks to the McGrath Clan Gathering, and visitors will be coming from USA, UK, SA and all over Ireland. We are looking forward to a great few days of great music, talks, day trips etc. Donnacha Gough from top group Danú will be supplying the music with friends on Thursday night in the Local Bar from 9pm. Seamus Connolly and friends will be in Minnies Bar on Friday night after the opening/talks at 9.30pm. There will be a music, song and dance show on Saturday night after the Clan Dinner in Clonea Strand Hotel. For the younger members of the Clan, we have organized reduced price tickets for Saturday night and a reserved area in Club Creation, the no 1 club in the area. There are a number of good bars in the town where you can enjoy DJs or a quiet chat. You could visit the Lady Belle Bar, the Anchor Bar, the Local Bar, or Downeys before you head to Club Creation. On Sunday night, there will be great session of music and song in Thig an Cheoil. It’s hoped to have some of the Clancy family join us as their mother was a McGrath. If there are any visiting musicians, dancers or signers, please let us know and we’ll be delighted to hear or watch you perform or join a session. This entry was posted in Uncategorized on May 28, 2013 by McGrath Clan (official).